Follow the Rota Vicentina along the coast from Cavaleiro to the attractive village of Odeceixe on this short break walking holiday to Portugal's unspoilt south-west. Spend three days hiking between villages, through the natural park of 'Sudoeste Alentejano e Costa Vicentina'. Your accommodation for the first two nights of your holiday is in the coastal village of Zambujeira do Mar. A transfer from Lisbon Airport to your accommodation is included on this holiday and takes approximately two hours. After checking-in, you may choose to spend some time exploring this charming village, set against a backdrop of wild beaches and rugged cliffs. There are several small cafes serving delicious, fresh custard tarts and coffee which you can enjoy. The cafes at the bottom of the village have wonderful views out to sea and great vantage points for sunset. This evening, we recommend enjoying a dinner of freshly-caught fish in one of the family-run restaurants in the village. Today's walk follows another section of the Rota Vicentina along the stunning Atlantic coast. This route alternates between rolling dunes and rocky cliff paths where storks nest, the views along the way are beautiful and there is no shortage of spots to stop for a snack and to take it all in. Following the coast, you pass pristine golden beaches and the fishing village of Azenha do Mar before reaching the mouth of the River Odeceixe. Here you turn inland and follow the river to reach the attractive, laidback village of Odeceixe, where you will spend the next two nights. On today's circular walk from Odeceixe first you follow the Rota Vicentina inland. Walk along an irrigation channel as it winds through farmed fields, then across an open landscape of heather and fragrant shrubs to the coast. Follow the fishermen's path across a beautiful natural area to the beach of Odeceixe. Enjoy a relaxing afternoon on the beach or if you prefer walk back to your accommodation and cool off in the pool. You can expect today's 13.5 kilometre walk to take approximately four hours. We recommend well worn, sturdy walking boots with good ankle support. Some people prefer to complete the walks in trainers or sandals as some of the walks are on beaches. Sandals and trainers are recommended for relaxing in the evenings. We'd recommend flying into and out of Lisbon. Lisbon is served by the following airlines; Easyjet, Ryanair and British Airways and TAP. At the start of your trip a private transfer is included from Lisbon Airport to the first nights' accommodation. 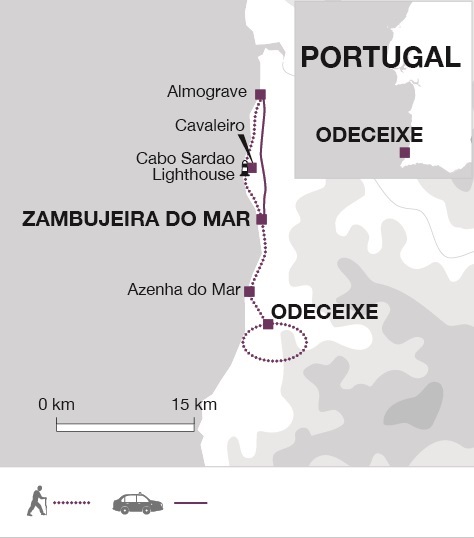 From Odeceixe there is a direct bus to Lisbon every morning at 09:20 hrs and arrives at Lisbon bus station at 12.50 (3.5 hrs and costs approx. 20 Euros). This bus needs to be booked in advance, you can't buy tickets on the bus. Tickets can be bought from http://www.rede-expressos.pt/ you either need to print tickets or show them on your phone when you get on. Alternatively you can book a private transfer through Explore. 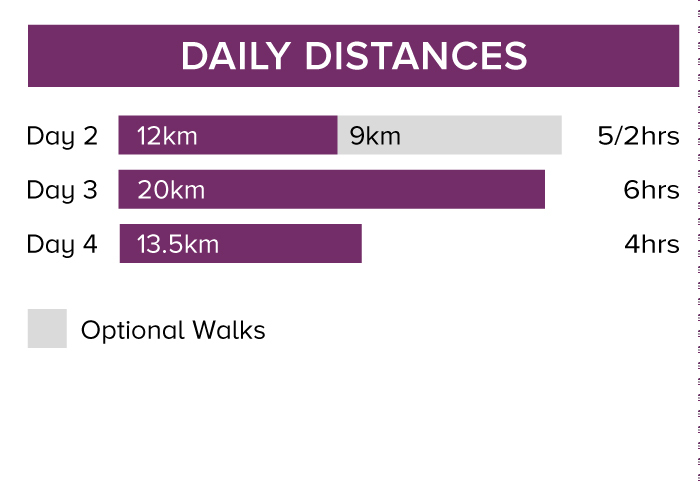 On this journey you walk 45 km over 3 days (an average of 15 km per day). The walks are mainly on unsurfaced tracks, coastal trails and footpaths. We have graded this trip as easy but there is an option on day 2 for a longer moderate grade walk. Tue 1 Jan 2019 - Fri 31 May 2019 Your trip can depart anytime between the above dates. Contact us for triple room requests and solo traveller prices. Sat 1 Jun 2019 - Sun 30 Jun 2019 Your trip can depart anytime between the above dates. Contact us for triple room requests and solo traveller prices. Mon 1 Jul 2019 - Wed 31 Jul 2019 Your trip can depart anytime between the above dates. Contact us for triple room requests and solo traveller prices. Thu 1 Aug 2019 - Sat 31 Aug 2019 Your trip can depart anytime between the above dates. Contact us for triple room requests and solo traveller prices. Fri 1 Nov 2019 - Sat 21 Dec 2019 Your trip can depart anytime between the above dates. Contact us for triple room requests and solo traveller prices. Sun 22 Dec 2019 - Tue 31 Dec 2019 Your trip can depart anytime between the above dates. Contact us for triple room requests and solo traveller prices. Wed 1 Jul 2020 - Tue 14 Jul 2020 Your trip can depart anytime between the above dates. Contact us for triple room requests and solo traveller prices. Tue 1 Sep 2020 - Mon 14 Sep 2020 Your trip can depart anytime between the above dates. Contact us for triple room requests and solo traveller prices. Tue 15 Sep 2020 - Wed 30 Sep 2020 Your trip can depart anytime between the above dates. Contact us for triple room requests and solo traveller prices. Thu 1 Oct 2020 - Mon 21 Dec 2020 Your trip can depart anytime between the above dates. Contact us for triple room requests and solo traveller prices. Tue 22 Dec 2020 - Sat 26 Dec 2020 Your trip can depart anytime between the above dates. Contact us for triple room requests and solo traveller prices. Sun 27 Dec 2020 - Tue 29 Dec 2020 Your trip can depart anytime between the above dates. Contact us for triple room requests and solo traveller prices.